1762-1821. He was born on 22 March 1762 to a Hamburg merchant, Charles Broughton, and his wife Anne-Elisabeth, the daughter of Baron William de Hertoghe of Hamburg. In May 1774 Broughton had his name entered on to the books of the yacht Catherine, Captain Alexander Hood, and in November he joined the brig Falcon 10, Captain John Linzee, in which he went out to North America in the following February and saw action at the Battle of Bunker’s Hill on 17 June 1775. Not long afterwards he was sent to attempt the recovery of a schooner that had grounded in Cape Ann Harbour after being boarded by Lieutenant Edward Thornbrough of the Falcon, but his boat was holed and he and his party were taken prisoner by the colonials. He was exchanged in December 1776 and joined the Eagle 64, Captain Henry Duncan, flagship of the commander-in-chief Vice-Admiral Lord Howe, removing at his own request on 14 February 1777 to the Haerlem 12, Lieutenant John Knight. He then rejoined the Eagle in the summer of 1778, being present at the defence of New York in July and skirmishes with the French fleet off Rhode Island in August before returning to England with Lord Howe and the Eagle on 25 October. Two months later Broughton joined the Superb 74, Captain Robert Simonton, with the flag of Rear-Admiral Sir Edward Hughes, going out to the East Indies in March 1779 and being present at the destruction of Hyder Ali’s pirate fleet at Mangalore in December 1780. On 12 January 1782 he was commissioned lieutenant of the Burford 68, Captain Peter Rainier, and in this position he fought in the Battles of Sadras on 17 February 1782, Providien on 12 April, Negapatam on 6 July, Trincomale on 3 September and Cuddalore on 20 June 1783. The Burford returned to Europe at the end of the war to be paid off at Woolwich on 19 July 1784. Broughton remained unemployed for the next four years until joining the Orestes 18, Captain Manley Dixon, on 23 June 1788 for service in the Channel and Mediterranean. During the Spanish Armament of 1790 he served upon the Victory 100, Captain John Knight, with the flag of Vice-Admiral Lord Hood, remaining aboard that vessel from May until December. In December 1790 Broughton was appointed to command the brig Chatham 6 which sailed from Falmouth in April 1791 in the company of Commander George Vancouver’s Discovery for the North American Pacific coast. During November, after the two vessels had temporarily separated, he discovered the Snares Islands to the south of New Zealand, naming the largest of them Broughton Island, and he also discovered and named the Chatham Islands. In 1792 the re-united vessels arrived off the north-western coast of America where the Broughton Archipelago was named after him in Queen Charlotte Sound, and where he was later employed on a survey of the Columbia River between the current states of Washington and Oregon. Broughton’s part in the expedition ended in January 1793 when he set off overland across Mexico via Vera Cruz and Blas to seek further instructions from the government in England regarding the Nookta Sound dispute. On 3 October 1793 he was promoted commander of the sloop Providence 16, which had recently returned with Captain William Bligh from his second expedition to collect breadfruit from Tahiti for use in the West Indies, and which he put into commission at Deptford. In this vessel it was planned that Broughton would sail back to the North American Pacific coast to try and re-unite with Vancouver. Throughout the early months of 1794 Broughton struggled to man his ship, and he then endured further delays at Spithead before in early October he finally received his orders from the Admiralty. The Providence eventually left St. Helens on 21 October with a convoy under the orders of Captain William O’Brien Drury of the Trusty 50, but adverse weather forced her into Plymouth where she remained until January 1795. In the middle of February she set sail with a huge convoy that was escorted to safety by the Channel Fleet, and after being detached with the West India bound fleet she parted company to take on provisions at Tenerife. By May 1795 the Providence was at Rio de Janeiro, and in August she reached Sydney prior to voyaging north to Tahiti and the Sandwich Islands. In March 1796 she entered Nookta Sound, and finding no sign of Vancouver Broughton traversed the Pacific to Japan. From September he surveyed the coasts of Niphon, the modern day Honshu, and Yesso, the modern-day Hokkaido, and reaching Tokyo Bay in November the crew shortly afterwards sighted Mount Fujiyama. Sailing on to Macao in the following month, Broughton took the opportunity to purchase a schooner and refit the Providence, whilst back in England, and unbeknown to him for some time, he was posted captain by the Admiralty on 28 January 1797. After returning to sea in April 1797 the Providence was wrecked on 16 May when she drove on to a coral reef near Miyako Island to the east of Formosa, the modern-day Taiwan. All the men were rescued by the attendant schooner, and returning to Canton Broughton was able to transfer some fifty men, including several young officers of good family, to the Swift 18, Commander Thomas Hayward, and a homeward-bound East Indiaman. Tragically many of these men were lost when the Swift foundered with all hands in the China Sea during December. Resuming his survey with the schooner, Broughton visited the east coast of Honshu then sailed past Hokkaido and along the west coast of Sakhalin off Russia. After surveying the coast of Korea he returned to Macao before setting sail for Madras in January 1798. Here he learned that the commander-in-chief, Rear-Admiral Peter Rainier, was expected at Trincomale, and upon reaching Ceylon he gave up the command of the schooner and on 19 May was brought to a court martial for the loss of the Providence. The verdict on him was one of acquittal, and although Lieutenant James Giles Vashon was dismissed the service for his inattention it was with a recommendation for consideration by the commander-in-chief, this being a request that was immediately accepted with Vashon’s appointment as second lieutenant of the Sibylle 38, Captain Edward Cooke. In February 1799 Broughton returned to England from Madras, and he began composing an account of his voyages and surveys that would eventually be published in 1804, although the Admiralty did not see fit to help bear the cost. In the early summer of 1801 he returned to active service with his appointment to the floating battery Batavia 50, the ex-Dutch Batavier, which he joined at Chatham and commanded off Margate prior to returning to Sheerness at the end of October. Despite the onset of peace in 1802 he remained in employment by joining the eighteen-pounder Penelope 36 in May, sailing from Portsmouth on 15 June to take Rear-Admiral Sir Alexander Ball out to Malta, and returning to the Hampshire port where the frigate was put into quarantine at the end of August. She subsequently saw service in the Downs towards the end of the year. Broughton had a great knowledge of the Far East, but although he planned the capture of Java in 1811 he was outraged when Admiral Stopford superseded him. Upon the re-opening of hostilities with France in April 1803 the Penelope was at Yarmouth when she received Admiralty orders to depart for a cruise off Goree with the Leda 38, Captain Robert Honeyman. By October Broughton was commanding a squadron of five frigates and three smaller vessels employed in the blockade of the Elbe and Weser Rivers in the North Sea, and she was back at Yarmouth in the following February. During that month he was brought to a court-martial at Sheerness by his first lieutenant, John Gedge, and was acquitted of what were deemed frivolous charges bar one of sleeping out of his ship on a couple of occasions. He afterwards rejoined his command, replacing the temporary captain, Charles Pater. The Penelope was present in Commodore Sir William Sidney Smith’s attack on the Flushing and Ostend flotilla on 16 May 1804, losing three men killed and four wounded, and she returned to Sheerness at the end of the month. Shortly afterwards Broughton assumed command of a squadron blockading the Schelde, and the Penelope returned to Yarmouth in March 1805 having made several captures on that station. Moving to the Channel station, she was fitting for foreign service at Plymouth in December but instead went out on a cruise from which she entered Falmouth in January 1806. A further cruise followed off the French coast as far south as Rochefort before she came into Plymouth in March, and she was in company with the Gibraltar 80 and Tribune 36, when they chased Prince Jérôme Buonaparte’s Veteran 74 off Belle Isle in August, this ship having been attached to Rear-Admiral Willaumez’s squadron before parting in storms on 18 August. Thereafter the Penelope sailed to join the Channel fleet off Brest and Broughton continued commanding her into the following spring. On 23 May 1807 he was appointed to the Illustrious 74, taking passage out from Plymouth to join her off Cadiz, and by the turn of the year she was refitting at Gibraltar. During April 1808 she had to return home after colliding with the Zealous 74, Captain William Pierrepoint, bringing with her a convoy from the Mediterranean, and she then sailed from Portsmouth in August to join the North Sea fleet. In January 1809 the Illustrious was with Rear-Admiral Sir Richard Strachan’s squadron at Deal when orders were received to sail for Portsmouth with the expectation that they would go out to Cadiz. She was present at the controversial Battle of the Basque Roads on 11 April, and notwithstanding the fact that Broughton spoke up for Captain Lord Cochrane at the court-martial on Admiral Lord Gambier he then backed down under further questioning from the accused. During his absence from the Illustrious Captain Edward Chetham commanded her in an acting capacity in the Schelde expedition from July. In January 1810 the Illustrious sailed from Portsmouth under Broughton’s command with a convoy for the East Indies, and in December, having been detached to Bengal to collect troops, she was present at the reduction of the Isle de France. In March 1811, following the untimely death of the commander-in-chief in the East Indies, Rear-Admiral William O’Brien Drury, Broughton arrived at Madras from Mauritius with a commodore’s broad pennant, as he was now the senior officer on the station. 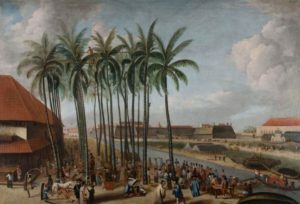 In this capacity, and with Commander Robert Festing in acting command of the Illustrious, he commanded the naval element of the expedition to Java, with the army under the command of Lieutenant-General Sir Samuel Auchmuty. Unfortunately for Broughton his cautionary progress, arising from concerns at moving such a body of ships in waters that were poorly charted, was so slow that Rear-Admiral Hon. Robert Stopford, arriving on his own initiative from the Cape with reinforcements originally designated to capture the Isle de France, was able to commandeer his forces. This supersedence might have been much to the relief of the officers involved, but Broughton was furious and requested a court-martial on his superior from the Admiralty which was denied. Meanwhile the Dutch colony was taken on 18 September with Broughton participating in the action. In October 1812 he returned to Portsmouth after a fifteen week passage from Madras aboard the Doris 36, Captain William Jones Lye, having had further cause for offence after Vice-Admiral Sir Samuel Hood, whose despatches he carried home, had taken the Illustrious for his flag. In the meantime he had demanded another court-martial, this time on Captain William Butterfield of the Malacca 36, which resulted in that officer’s dismissal from his command for exceeding his authority. Having resigned his commission Broughton did not obtain any immediate employment, but in December he attended a levee held by the Prince Regent. He was nominated a C.B. on 4 June 1815 and with the return to France of Napoleon he commanded the Royal Sovereign 100 in home waters from June 1815, prior to removing to the Plymouth guard-ship Spencer 74 at the end of August. He remained with this vessel until September 1818, having his son aboard for the last year of that commission, and thereafter retiring to Florence he became a colonel of marines on 12 August 1819. Broughton died on 12 March 1821 from an angina attack, and he was buried in the English burial ground in Leghorn. On 26 November 1802 at Portsmouth he married his cousin Jemima, the fifth and youngest daughter of Sir Thomas Delves Broughton Bart, of Doddington Hall, Cheshire. The couple had three daughters and a son, William, born on 23 October 1804, a naval captain who was posted in 1832 after a great deal of active service. 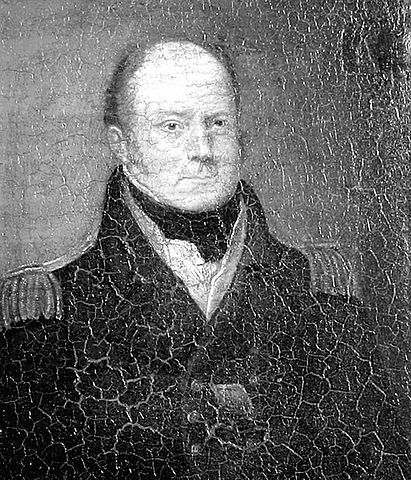 Difficult to serve, and described as ‘puzzle-headed’, Broughton never forgave Rear-Admiral Stopford for taking over the Java expedition, and he even fell out over the matter with the amiable Rear-Admiral Sir Samuel Hood, the new commander-in-chief in the East Indies, who complained of being threatened and dictated to in the matter of Broughton going home to arraign charges against Stopford. During his voyage of discovery he named Knight Island after his great friend, the future Admiral Sir John Knight.